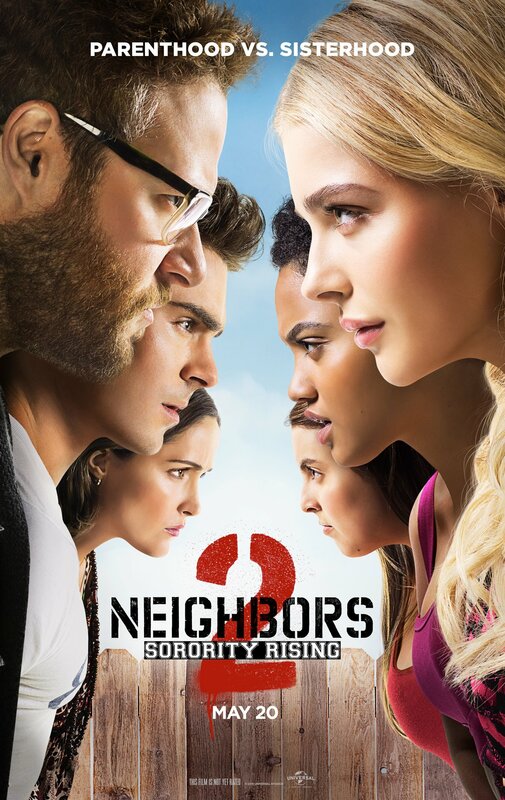 If Seth Rogen and Rose Byrne’s well-to-do parents had their work cut out for them in Nicholas Stoller’s riotous comedy, Neighbors, then the couple won’t be too keen to hear that there’s a sorority on the rise. Specifically, one spearheaded by Chloe Grace Moretz in this year’s hotly-anticipated sequel Neighbors 2: Sorority Rising. Releasing by way of Point Grey Pictures and Universal, today heralds the arrival of a new poster for Stoller’s follow-up, which finds Rogen, Byrne and Moretz’s hard-partying Shelby on opposite sides of the white picket fence. Forced to put old differences aside, in their fit of desperation, Mac (Rogen) and Kelly Radner (Byrne) turn to Teddy (a largelry shirtless Zac Efron) for help. He is, for lack of a better term, their ace in the hole, and it’s left to Efron to infiltrate the Kappas’ home – a strategy that, yes, doesn’t exactly go according to plan. Setting out to prove that the 2014 sleeper hit wasn’t a one-trick pony, Point Grey Pictures and Universal will launch Neighbors 2: Sorority Rising – starting a turf war in the process – into theaters on May 20. Lisa Kudrow and Billy Eichner also star.